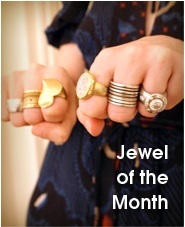 I was going to wait until we were further into February to reveal the Jewel of the Month, but I just put the finishing touches on it today and I can’t resist sharing! 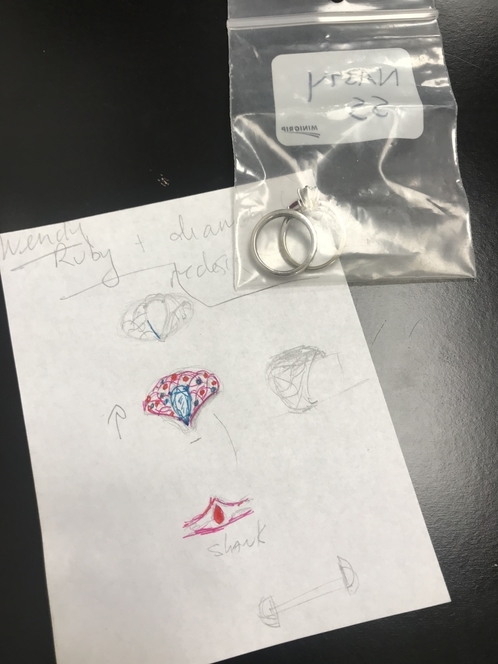 Gorgeous client Phala asked me to turn her classic ruby-accented engagement ring and wedding band into a nontraditional, single ring. For inspiration, she selected two of my previous custom designs, both with my signature “vine” style. 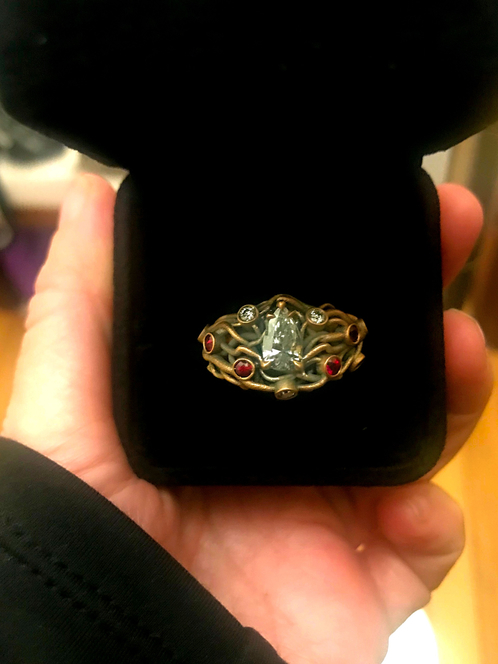 The first was my right-hand woman Eryn’s engagement ring. 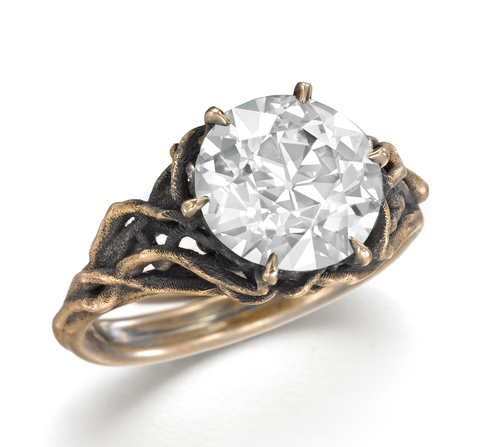 Click to see the design process for Eryn’s ring … and the proposal! 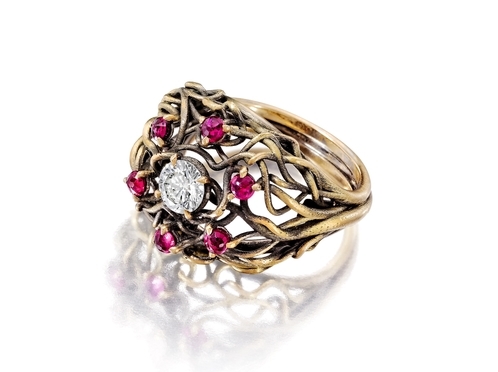 The second was Barbara’s redesigned ring, which just so happens to include rubies. Click for original post on this ring. I wanted to play up the pear-shaped diamond. 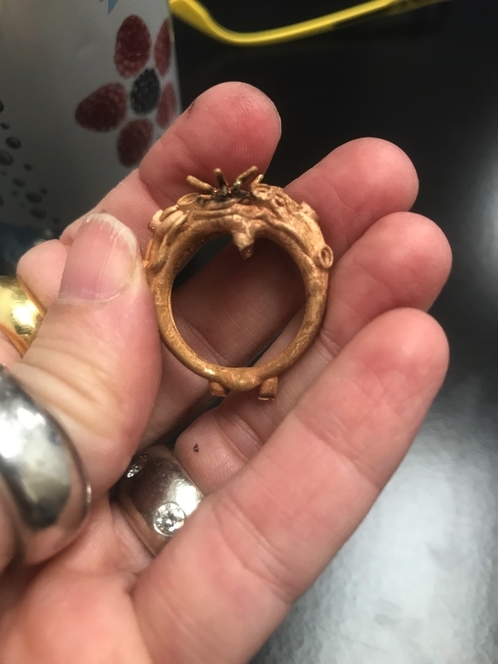 … before I could get around to casting the design in the blackened 18K rose gold that Phala requested. 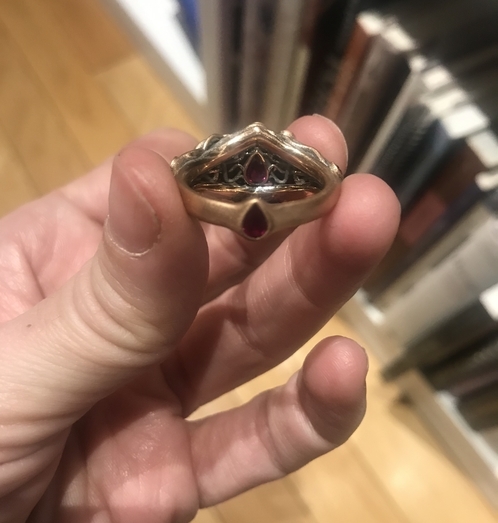 At the beginning of the process, my goldsmith asked if we had to use all of the stones, because he was concerned that the ring would become too large in an effort to fit all of the gems. 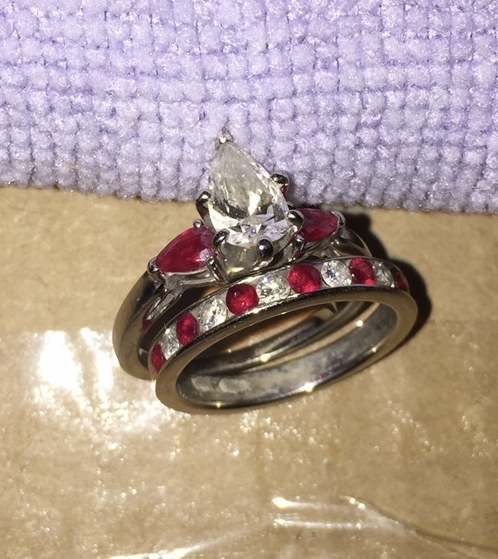 I had a solution for this: One ruby inside the ring and another on the back. The ring from the back. 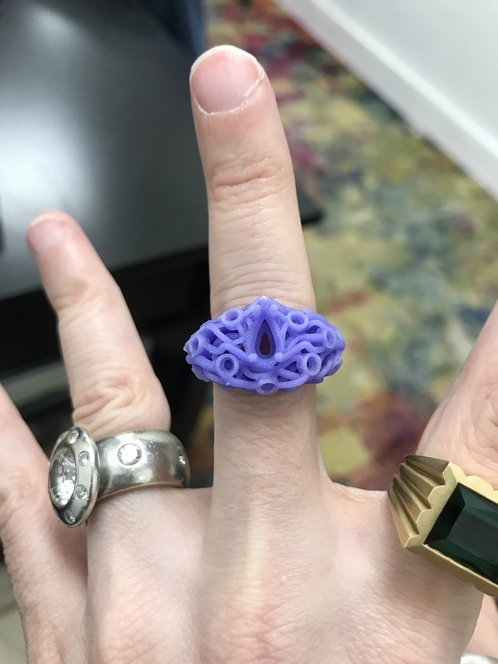 And here’s how the ring looks from the front, in a very “candid” (aka nonprofessional) photo. I don’t always have the opportunity to take a well-lit professional shot of custom work. A lot of times the piece has to get to its new home quickly, in time for a birthday, engagement, or another celebratory occasion. In those cases, I’ll do a blog post with a casual snapshot like this. But Phala agreed to let me hang on to her ring for another week, so that I will be able to get a high-quality photo. The only excuse I have for this post is a lack of impulse control! Stay tuned for the beauty shots coming later this month. Until then, this Instagram video gives you the best perspective on complete piece. 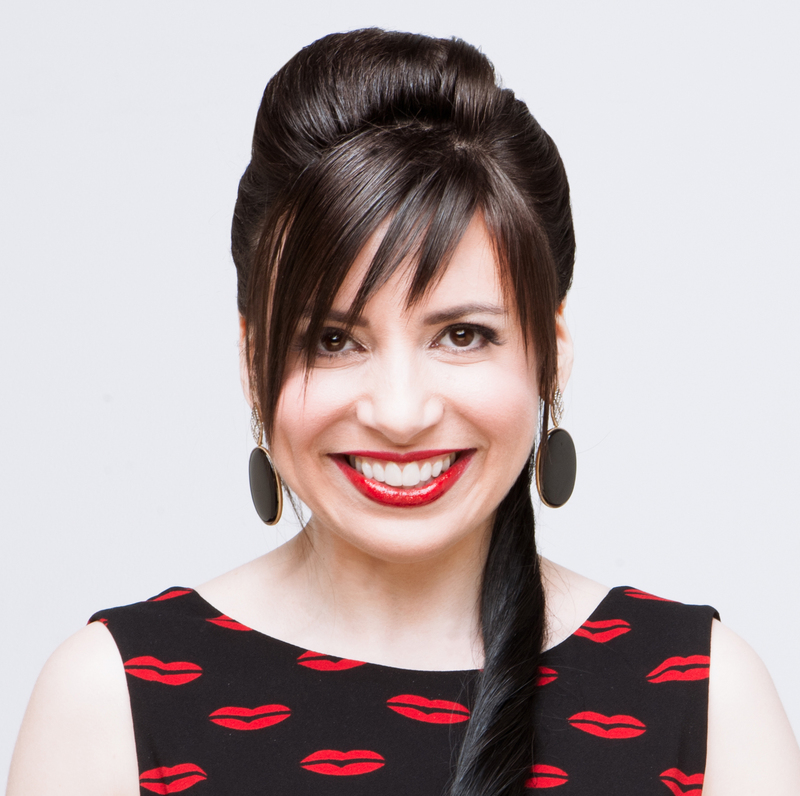 Ready to redesign some of your jewelry? 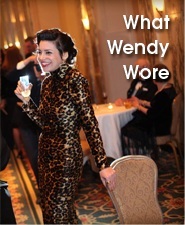 Get the ball rolling by emailing me at info at wendybrandes dot com with photos of your old pieces.